Individuals who have undergone one or even multiple rhinoplasty procedures still sometimes don't achieve the desired outcome, forcing them to consider yet another procedure. Rhinoplasty can be one of the most difficult plastic surgery procedures to perform. Fortunately, double board-certified and expert facial plastic surgeon Dr. Jason Champagne is accustomed to the subtleties of the face and has performed countless revision procedures for patients who were not satisfied with their previous surgeon's results. Being at the center of the face, the nose draws attention to itself, and a less adept surgeon may not recognize minute details of your nose that will affect the outcome of your rhinoplasty. Ultimately, this failure to recognize potential undesirable outcomes may lead to a less-than-desirable result. With either the aesthetics or the function of your nose, Dr. Champagne offers his expertise to help develop a customized plan in order to help you reach realistic goals in a revision procedure. The nose is a complex, three-dimensional facial feature, and even the most minute irregularity can affect the overall appearance of a person's face. There are also other issues one faces with a revision rhinoplasty. For example, lack of cartilage taken out from previous procedures and/or excess scarring can greatly affect a revision procedure's outcome. Dr. Champagne will work with you closely to learn your goals and set realistic expectations to get you looking your best. Also, during a revision procedure, Dr. Champagne can not only improve the appearance of your nose but he is also able to correct nasal breathing function by performing either a Septoplasty (Nasal Septum), Turbinate Reduction or both. 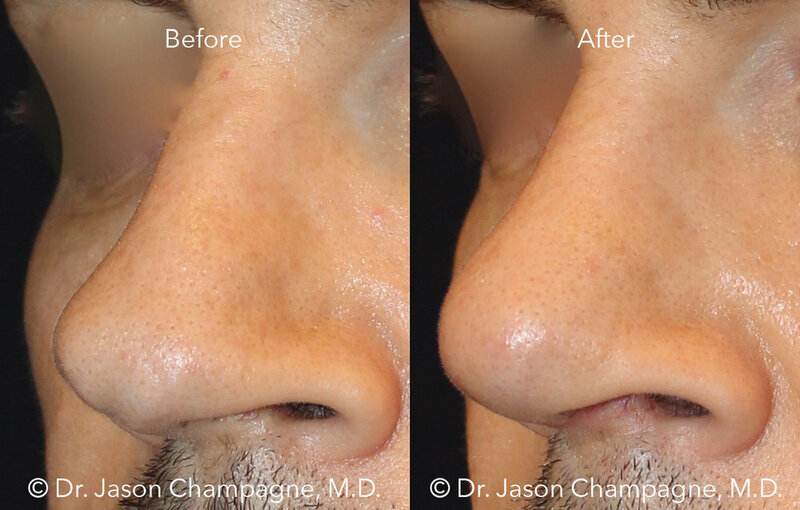 So if you are looking to correct one or multiple rhinoplasty procedures, please contact our office to schedule a personalized, confidential consultation with our expert facial plastic surgeon, Dr. Jason Champagne. During your consultation, Dr. Champagne will address your goals and answer any questions you may have regarding a Revision Rhinoplasty, Septoplasty or Turbinate Reduction procedure. Still Dealing with Hair Loss?